Al Hail Fort, dating back to the Iron Age (1300-300 BC). 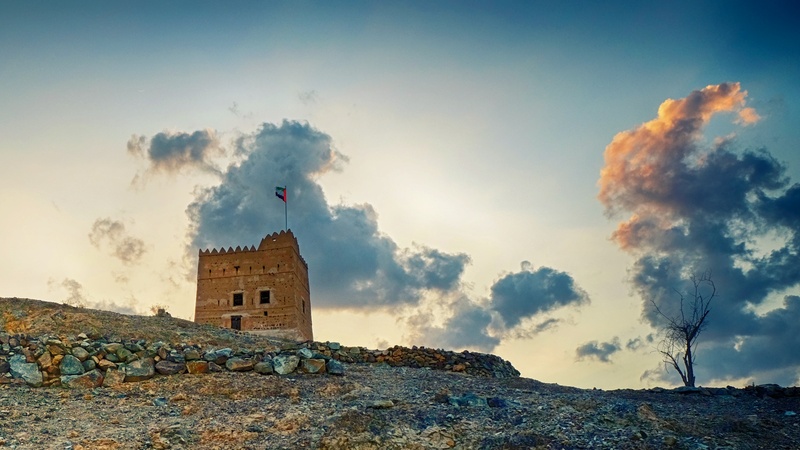 Nestled in Wadi Al Hail, 13km west of Fujairah, the old castle and its watchtower are well-known because one of the palaces was once occupied by the Al Sharqiyin ruling family. The monument lies in an enclosed compound, has meeting rooms, bedrooms, storerooms and a kitchen. It is well defended by a boundary that has weapons ports and battlements enabling the Al Hail people to fight off raids by neighbouring tribes. The main reception area, or majlis, is rectangular and attached to the tower. Its walls have beautiful engravings and the room is plastered in white lime. An hour long drive from Dubai it is a fantastic weekend get away.